Following are your next steps to enroll at Purdue. Visit the account activation website. You must reactivate your online career account to access your online myPurdue portal, through which you will conduct much of your future business with the University: course registration; fee payment; financial aid award review and acceptance, and more. Career account activation also creates your @purdue.edu email address. To activate your career account, you will need your Purdue University ID (PUID) number and your career account setup password, both of which are provided in your admission offer letter. 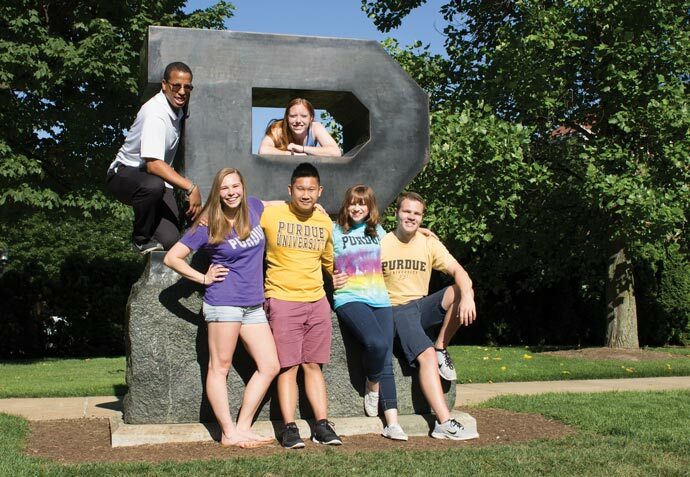 Accept your admission offer via myPurdue. No deposit will be required, but you must accept your offer before you will be able to register for classes. File a FAFSA as soon as possible. We strongly recommend that you use the FAFSA's data retrieval tool to transfer your IRS tax information directly into your FAFSA. You must reactivate your online career account to access your online myPurdue portal, through which you will conduct much of your future business with the University: accept your admission offer, course registration; fee payment; financial aid award review and acceptance, and more. Career account activation also creates your @purdue.edu email address. Contact your academic advising office to make plans for class registration. Visit the Office of the Registrar website for the class registration schedule. Students reentering after more than five years may be eligible for Academic Renewal. If you qualify, you may discuss this option with your academic advisor. Students who enroll after being readmitted may not register for more than 15 credit hours (9 credit hours for summer) for their first academic term back at Purdue. In addition, readmitted students must earn a 2.0 GPA or higher for each term until their cumulative Purdue GPA is above 2.0. For subsequent terms, reentry students should consult with their academic advisor or refer to Purdue’s Academic Probation and Deficiency policies for information about student academic requirements. You must activate your online career account to access your online myPurdue portal, through which you will conduct much of your future business with the University: online course registration, fee payment, financial aid award review and acceptance. Career account activation also creates your @purdue.edu email address. Accept your admission offer. When accepting, new freshmen and transfer students must pay a nonrefundable $400 deposit, which will be applied toward first-semester fees. Re-entry and readmission students at Polytechnic Statewide must accept the admission offer, but no deposit is required. Contact the Statewide Program Coordinator at the location to which you have been admitted to make plans for class registration and to learn about your next steps. Visit the Purdue Polytechnic Statewide website for more information. You must activate your online career account to access your online myPurdue portal, through which you will conduct much of your future business with the University: online course registration and participation, fee payment, and more. Career account activation also creates your @purdue.edu email address. Visit the Veterinary Technology Distance Learning website for information on next steps for admitted VTDL students. Purdue requires final grades from any coursework completed prior to enrollment, and it is your responsibility to ensure we receive official documentation (including any final transcripts). Purdue's expectation is that admitted students will maintain a consistent level of academic performance, and we reserve the right to rescind an offer of admission to any student who demonstrates a significant decline in grades between admission and enrollment.